Up at my normal early hour and packed and moving before six. I want to do another thirty plus day today to see if I can make it a regular thing. The sky above me through the trees is a grayish white this early, it's only as I break into the open that I can see it's another blue sky day. The grasses lining the trail are dry and dusty, as is the trail. It's been along time since this forest has seen rain. The trail through this section is designed the opposite of the trail through the High Sierra. In the Sierras you climb up to a pass, go over the saddle, descend down to the stream or river below, repeat, repeat, repeat. Here it is an unusual thing to go over a pass, or to climb switchbacks. The trail follows the ridge line where ever it may go. The trail is very circuitous, even going south for miles. In fact the northbound trailhead at highway three is on the south side of the highway. The trail from Mexico actually descends to the north side of the highway. Today was payback day for all of the climbing I did yesterday. The trail goes down for miles and miles at a gradual descent that makes it possible to keep a pretty good pace. Traveling for the most part in shady forests of pine and fir. That is until I come to a rocky section where I have to slow down. The rocks are red and volcanic looking. The trail cuts through or across these rocky slopes, just rocks, no plants. I suppose someday they'll decompose to dirt, right now it's just rocks. Littler rocks define the trail. These are the baseball and golf ball sized rocks I call cobbles. They are a little flatter than the cobbles in the rocky parts of the trail in the Sierras so they don't feel quite as treacherous. They still wobble unexpectedly if you don't expect it. So I try to always expect it, which is why I slow down. Down, down, down, just crusin’ without expending much energy. Down and around the entire ridge line ending up across from where I originally started but putting in a ton of miles to get all the way around. Today was Slobber’s twenty eighth birthday. Slobber's family drove down to Scott Mountain Summit and met him there. They did trail magic for any Thru-hikers that showed up. I showed up and had some hotdogs, chips, cookies, and soda. I also signed Slobber's birthday card. Happy birthday Slobber, thank you Slobber's family for the awesome trail magic. After Slobber's birthday bash I started up the south side of the pass, which is what you have to do to go north on the PCT. Up and up, up is easier now for me than it once was. Especially now that my knee isn't acting squirrelly on every step. It's so hot. I must get higher up. Up to the cooler air. There isn't a breeze and its stifling. The tree cover is sparse and walk out into the sunshine is like walking into an oven. I am drinking the water I've been carrying for just a moment as this. I am so glad I have it. I check the map to see where the next water is. It says three miles. Ok, that means roughly an hour. I can do that. Even after all the miles I've walked I still struggle with believing how far a mile really is. It is soooo long when I stare at the app on my phone and watch the mileage slowly wind down. Miles seem to change in length. It's always longer in the afternoon than first thing in the morning. Always longer if it's hotter. The elasticity of a mile depends on many factors. The shortest ones are first thing in the morning. These late afternoon miles have the ability to discourage and dissuade me from hiking them. I'd be tempted to stop if there was a place to camp but the trail is narrow and on a steep slope as it climbs. As I get higher the snowy peak of Mt Shasta dominates the eastern horizon. So at least there's that, an awesome view. I set up camp on a ridge overlooking more mountains. 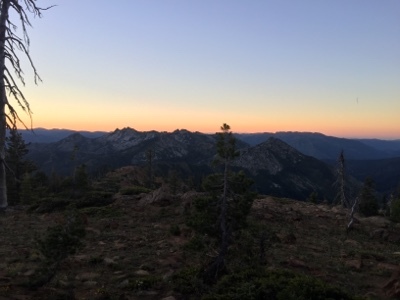 The Trinity Alps are rugged and sharp. Jagged rocks point to the sky. Deep rock ringed bowls hide small round emerald colored lakes. The mountains go on seemingly forever, layer upon layer stacked to the horizon. Each layer bluer than the one beneath. The sun slants light down from over my right shoulder. The air is cool. I cook dinner looking out at my awesome view. The breeze is so comfortable. I climb into my tent and sleeping stuff and lay listening to the breeze blow in the tree tops. It's such a pleasant soothing sound it lulls me to sleep.